It is my very first time coming up with ideas for a Trunk or Treat! My girls actually came up with the theme and name for this post! Yay for creative little girls that love to participate with my party photo shoots! We started out by making a trip to our favorite store, the Dollar Tree! We picked up a few things and spent less than $10! The hanging ghosts at each end, the mini ghosts next to the donut holes and the ghost on the side table are all from there! I crafted a couple of things like the jack-o-lantern banner hanging across, the table runner and the HAPPY HALLOWEEN and BOO signs with silver glitter! You can find these items in my etsy shop to purchase. Inside the trunk I set up a cute Halloween stand from Target. I tied a ghost ribbon around it from Michael’s. I bought donut holes for $1 at my local grocery store. I dressed them up with party circles I punched and added spider stickers on them….aren’t they cute? I set up a small table to the side of the car where I could put some more goodies for the kids! The table has drinks, bags with candy, cups with Doritos and a basket with candy for kids to get some more! I added some home decor on the table to jazz it up! You can find the white cups at the Dollar Tree as well. 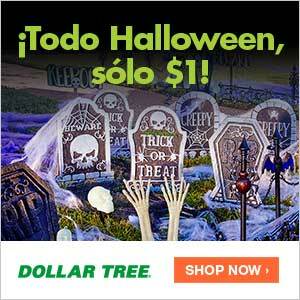 Everything Is Just $1 At DollarTree.com! Happy early Halloween and let the festivities begin! Don’t forget to click on all these fabulous blogs to see more trunk or treat ideas for this year! YAY!! I love it all! But I think my favorite part is how you transform plain treat containers into something spectacular with such easy, doable details. What amazing creative vision!